COMMELL LV-650 Mini-ITX based on AMD Geode GX1 and CS5530A , provides the 300+ MHz of computing capacity at the Ultra-low power, embedded, x86-compliant architecture for the industrial embedded computers. With AMD Geode GX1 platform and high integration,< LV-650 be the ideal solution for industrial embedded applications with the features as below. Low Power Embedded Computing Platform : The AMD GX1 processor provides the lowest power consumption for any x86 processor at this performance level with a typical average power consumption ranging from 0.8 to 1.4 watts. The enhanced thermal characteristic Onboard 64 MBytes SDRAM : The onboard embedded SDRAM let LV-650 be the low profile solution with space-/slot-saving for system configuration. It also makes LV-650 be the rugged and vibration-proof solution with embedded CPU and memory. LVDS/TTL Flat Panel Interface : The integrated LVDS/TTL interface offers the digital video output for flat panel with built-in VGA controller and 4 MB video memory. All-In-One Integrated Solution : LV-650 is an all-in-one computing platform with integrated video, audio, LAN, Compactflash Socket, PC/104, Serial Port and USB interfaces, is requiring 12VDC only. Integrated AC97 3D audio, 2 x 10/100 Mbps Fast Ethernet interface. Embedded PC/104 interface for 8/16-bit ISA-based PC/104 embedded peripheral modules. CPU Onboard embedded AMD Geode GX1 300 MHz CPU . Memory Onboard optional 128MB SDRAM and one 168-pin DIMM socket supports additional 256 MB SDRAM. 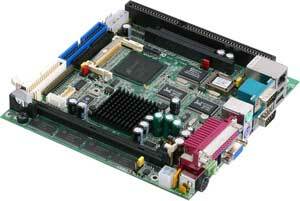 VGA Interface: AMD Geode CS5530A built-in VGA controller with 2D engine and 4 MB of video memory shared with system. Flat Panel Interface Integrated 18-bit LVDS and TTL panel interface for TFT display. Expansive Slots 1 x ISA Slot , PC/104 Connector. LAN Interface 2 x 10/100BASE-Tx Fast Ethernet(one is optional). Audio Realtek ALC201A audio interface. I/O Ports 2 serial ports, 1 parallel port, IrDA, FDD, PS/2 keyboard and mouse ports. Solid State Disk On board CompactFlash Type-II socket. Digital I/O Supports 8 bit In/8 bit out digital I/O. Watchdog Software configurable, 1s.....255s / 1ms.....255 ms.
Power Supply +12V only supply be used. LV-650-64 Same as above but with 64MB SDRAM on board. LV-650-128 Same as above but with 128MB SDRAM on board.